Every year for the last three years, I’ve completely devoted my second day of school to the topic “but why are we even learning Spanish.” Since I teach middle-schoolers in an area where there aren’t a ton of native speakers around, sometimes it’s hard for the kids to think outside of their bubble and understand that Spanish has real world importance, relevance, and benefits to them. My second day of school is all about getting them to buy into the fact that learning Spanish is a skill that will help them in their real lives outside the classroom. I love this lesson the first week of school not only because it’s important to talk about why we’re doing what we’re doing, but also because it’s super easy to update every year (an easy prep for me)! Since it’s a very learner-driven lesson, it lets me stay in the 90% Target Language zone to give instructions, even though the meat of the lesson and the students will be mostly in English. If we’re going to have a lesson in English, at least I can stay in Spanish myself the whole time. After our warm-up, I start class off by explaining to students that it is very important to me that they are able to answer the question “why are you taking Spanish,” beyond a default “because my mom is making me.” I emphasize that I teach Spanish because I think it’s fun, but I also teach Spanish because I think it will greatly improve and enrich their lives. I usually have to use a little bit of English here in my Level 1 classes, but not my Level 2s. 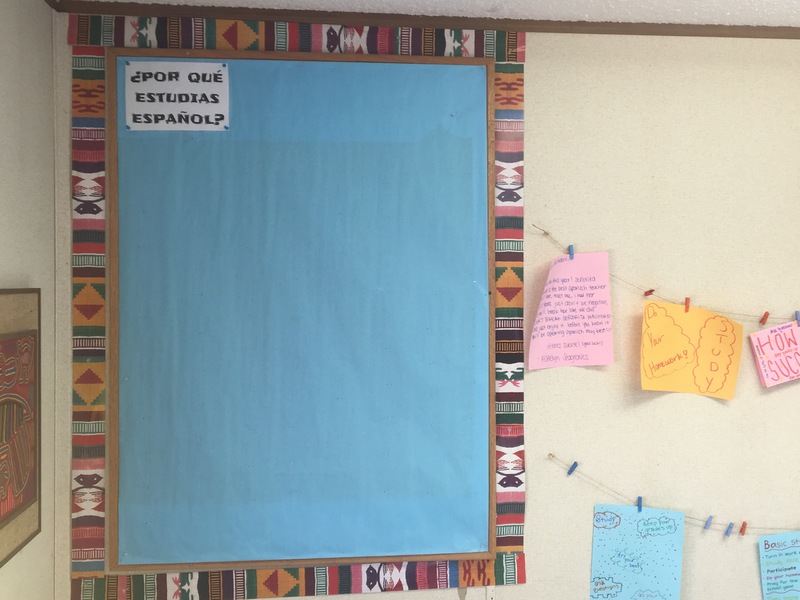 I point to the blank bulletin board at the back of the room that says “¿Por qué estudias español?” on it, and tell them we’re going to be filling it up today. While I’m talking, I hand out a blank chart with a list of resources on the x-axis and two columns on the y-axis that say “Three reasons to study Spanish presented” and “Best reason to study Spanish presented.” This paper is the anchor of our lesson for the day (preview an example here). The first resource listed is always a video. The past few years I’ve used Lindsay Does Language’s “9 Reasons to Learn Spanish.” It’s modern, quirky, and pretty funny, and I can always give them some solid input in Spanish beforehand to set it up (she is a girl from England and she’s funny but she talks really fast, etc). This is a good opportunity to introduce “escribir” and “mirar” as well when giving kids instructions. 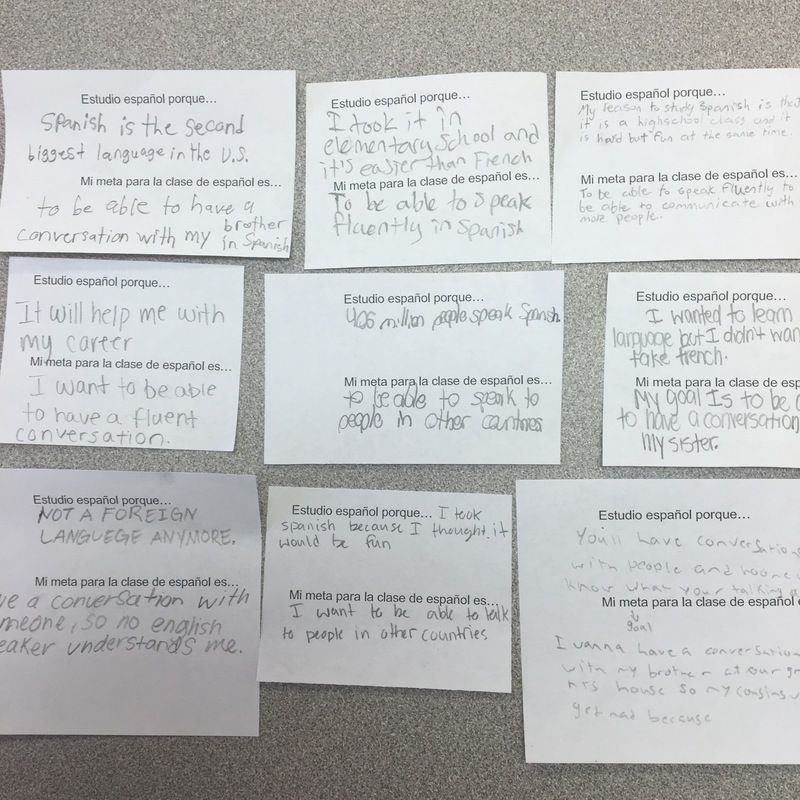 After we watch the video twice, students write down their favorite three reasons to study Spanish from the video in the middle column, and then pick their favorite out of the three for the last column. I emphasize to them that the last column (the personal favorite column) will be different for each person and will depend on each person’s life experiences and goals. Starting with the video is great since we review the first resource as a class and can work the kinks out together. After the video, the real fun begins. Students become “experts” in their resource. In this case, I give students 2 minutes to silently read through their article or infographic and decide individually (silently!!) 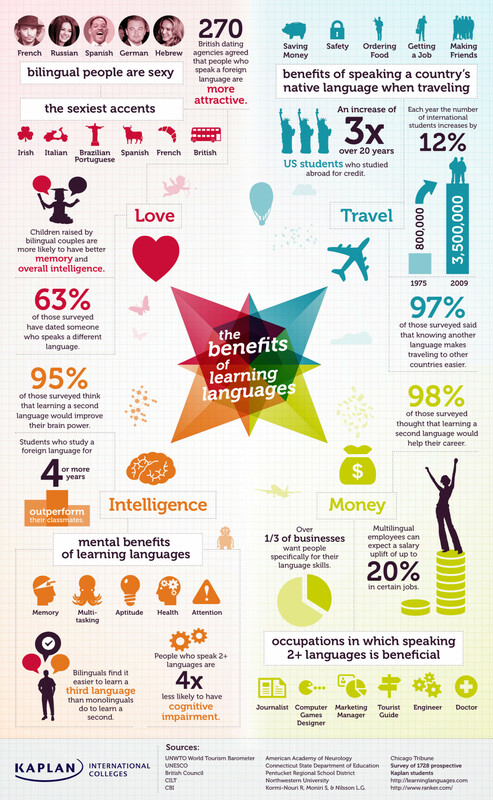 which three reasons to study Spanish presented in their article are the best ones. After two silent minutes, they must come to a consensus in their expert group about which reasons are the best. I like making them come to a consensus because it forces them to argue with each other about which reasons to study Spanish are more important (love it). Once each expert group has reached a consensus about the most important points of their resource, they have to go back to their original tables and report on what they read about. Again, none of the kids at their original tables have the same resource, so the students depend on each other to be able to complete their chart for each article. If you have a slacker in an expert group, his or her table group suffers, which forces everybody to participate (peer pressure!!). Before they start presenting to their original groups, I instruct them to stand up and present their ideas formally to their tablemates, NOT to just switch papers and copy down each other’s answers. I do this to start getting students used to talking with their peers, and also to get them used to standing up and presenting. Spanish is not a class where you can sit quietly the entire year, so I think it’s important that they get a chance to stand up and talk during the first week (even though it is in English). I love that they’re only presenting to their tables, not the whole class. This reduces anxiety, since there’s so much noise while everyone is presenting at the same time, and eases them into the scary idea of talking in front of the class. Each kid fills out their paper based on what their classmates present, but they also have to grapple with the material a bit individually when they think about which reason presented in that article is most important TO THEM in that third column. To complete their table, they have to pick out the reasons from each presentation that are most relevant to their lives, so the activity stays very personal. Once the jigsaw activity is over, I bring the whole class back together and show one last video. I love this one because it’s short; it makes them think, and it makes a bunch of really great points about language learning in general that can be applied to Spanish. After they’ve filled out their tables based on the last video, the students have about 18 different reasons to study Spanish that they’ve gotten from videos, articles, and each other (NOT from me, which I love). The last row that students have to fill out asks them to list their top three reasons for studying Spanish, and at this point they can add their own if their reason to take Spanish hasn’t been presented that day. Their exit ticket is that they have to write down their number one reason for learning Spanish. On small cut-out pieces of paper, and I also ask them to write down their goal for learning the language. I tell them that this isn’t a class goal (I don’t want a million papers that say “my goal is to get an A”), but this is a language-learning goal for life (like “I want to be able to have a conversation with my aunt from Puerto Rico,” or “I want to be able to talk to my friend in Spanish and not have people understand us in the hallway”). I’m always surprised by the quality answers some of the students come up with. My favorite part of the lesson is that I staple the exit tickets to the bulletin board at the back of class, and that is where they stay all year. I love that we have that constant reminder of why Spanish is important, and a constant reminder of a real world goal for learning language. The best thing of all about that reminder is that it comes from the students themselves, not from me. I’m really excited to be finishing up the first week of school and to dive into the Spanish learning next week, but I do also always love starting the year off with big picture reflection on why we’re spending time together in Spanish class. If you’d like to use this lesson in your classroom, but don’t want to go through the work of putting it all together, you can purchase it on Teachers Pay Teachers here. Student perspective: is it okay to lie on language tests? I did this lesson today with a few modifications and LOVED it. The kids were so engaged. Thanks for sharing! Yay!! Thanks for sharing Jennifer; I’m so glad that it went well for yall. Appreciate you taking the time to let me know!